Imagine driving in a rainstorm without windshield wipers, or being trapped in a sixth-floor apartment with no fire escape. If it weren’t for a couple of women with ingenious ideas, these scenarios might have remained reality for a lot longer. Check out these five female inventors and their innovations, each of which has helped make the world a safer place. At the turn of the 19th century, when cars were just beginning to outnumber horses and buggies, drivers had to stick their heads out their car windows to clearly see the road when it rained. Mary Anderson set out to devise a way to help drivers see better. After much trial and error, she invented a hand lever device, operated by the driver or a passenger, that used rubber wiper blades to remove rain from the car’s windshield. Anderson received the patent for her windshield idea in November of 1903, and by 1916 windshield wipers were a standard feature in all American cars. Because of her, drivers, pilots and conductors can clearly see where they are going and no longer need to pull over to clean their windshields. Prior to 1887, fire escapes consisted of wicker baskets on a pulley and chain. Then Anna Connelly patented a fire escape bridge, open at both ends and surrounded by a railing, that allowed residents of one building escape to another. 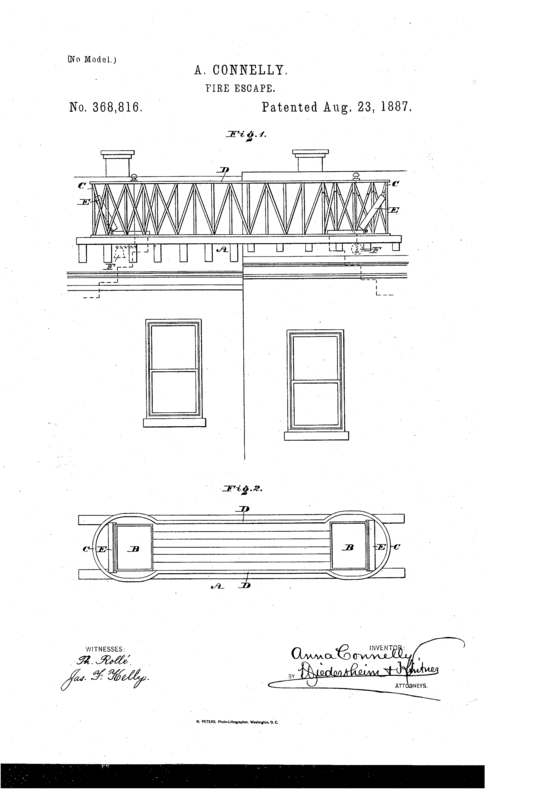 Her invention inspired the zig-zagging metal fire escapes used on many urban buildings today. Silent film star Florence Lawrence (born Florence Bridgewood) made more than 200 films in the early 20th century. But her biggest legacy was her invention of turn and brake signals. After buying her own car, the automobile enthusiast invented a mechanical arm that, with the press of a button, raised a flag on the car’s bumper, signaling which way the car was going to turn. Her brake signal raised a stop sign on the car’s bumper when the driver pressed the footbrake. By 1939, Buick had made electrical turn signals in its car fleet. Unfortunately, Bridgewood never patented her ideas and didn’t get recognition for inventions. Her mother, Charlotte Bridgewood, was also an inventor. She continued the work of Mary Anderson and patented the first electrical windshield wipers in 1917. One of the very few women to make a profit from her inventions, Maria Beasley invented a life raft for use in case of a shipwreckin 1882. Beasley's raft had guard railings attached by hinges and was designed to fold and unfold easily. Other inventions that can be attributed to her include a machine that made wooden barrels, an anti-derailment device for trains and a foot warmer. In 1971, inventor and scientist Stephanie Kwolek discovered a liquid crystalline polymer solution that led to the invention of Kevlar — a fiber used in the production of bulletproof vests. Kevlar, a synthetic material five times as strong as steel, is resistant to wear, corrosion and flames. Aside from bulletproof vests, this fiber is used in safety helmets, suspension bridge cables, hiking gear and more.